The modern smartphone is a remarkable device. A single device that fits in your pocket can do all the tasks that once required cameras, camcorders, GPS devices, watches, alarm clocks, calculators, and even TVs. But the next change might be the most radical of all—it could eliminate the need to carry cash and credit cards. Apple Pay was first out of the gate, but now mobile wallets are everywhere you look—Android Pay, Google Pay, Chase Pay and even Walmart Pay are making smartphones a real alternative to carrying credit cards. And the potential for mobile wallets to limit a merchant’s fraud liability could help them really take off in acceptance for small businesses. As consumers move more purchasing online, gateway vendors that can act as a front-end processor for online businesses are seeing explosive growth. PayPal-owned Braintree grew 111% YoY in the number of cards on file in Q4 2015, while Stripe and Klarna now have multi-billion dollar valuations. Mobile Point-Of-Sale (mPOS) startups like Square and ShopKeep have pioneered a whole new payments niche—accepting payments via tablets and smartphones. Coupling their transactions capabilities with new apps can revolutionize a small business’ inventory management, marketing, loyalty and even payroll. Mobile Peer-to-Peer payments in the U.S. are forecast to grow from $5.6 billion in 2014 to nearly $175 billion by 2019 as consumers increasingly skip the hassle of writing a check or going to an ATM. But smartphone vendors like Apple could cripple the dominant player of 2016 (Venmo) if they make a serious push to own the space. Fortunately, managing analyst John Heggestuen and research analyst Evan Bakker of BI Intelligence, Business Insider's premium research service, have compiled a detailed report that breaks down everything you need to know—whether you’re a payments industry veteran or a newcomer who is still getting a basic knowledge of this complex world. 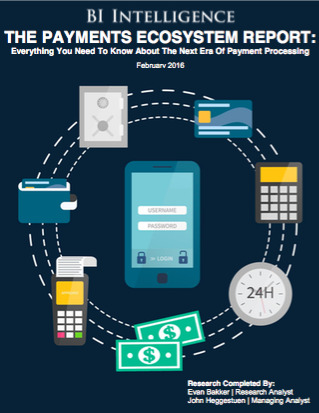 The 5 key events of 2015 that have set up 2016 as a watershed year for the entire payments ecosystem. The basics of traditional card processing from the start of the process through to the very end. Why new players and innovations like prepaid cards, store cards, and PIN debit transactions are gaining market share and creating new opportunities. The effects—good and bad—of the transition to new mobile payment methods. New players and old have surprising threats and opportunities in areas as varied as carrier billing, remittances, wearables, and more. The critical steps in credit card transactions and how they are changing. The six major types of organizations involved in the payments ecosystem. The significant differences for industry players who operate closed-loop networks and offer prepaid cards. The challenges and opportunities facing hardware and software providers for the payments sector. The 8 reasons why mobile wallets are growing so fast and how they will disrupt all aspects of the mobile ecosystem. The exciting possibilities ahead in fast-growing payments subsectors like remittances, connected devices and mobile P2P payments. It was a great pleasure working with koresol. koresol has been very extremely professional in every way to meet our needs. They took the initiative to drive our web solution design by presenting several great options and minimized work on our end. We were satisfied with koresol's project management skills and professionalism. They really took ownership of their work and came up with alternatives which exceeded our expectations. We contacted koresol to revamp our old web solution which had more or less turned into static page due to dependency on backend IT team to make any changes.